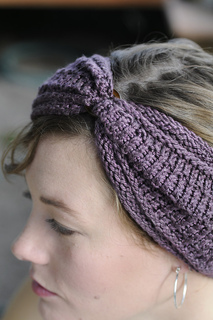 A simple design with a unique construction shows off a slinky, drapey yarn with shine to spare in the Greta Headband. 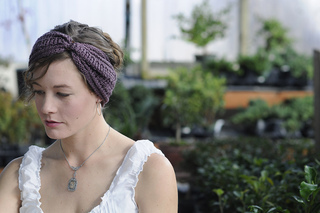 Doubled fabric creates rich ruching around a bone ring, while purl stitches add just enough stitch detail. 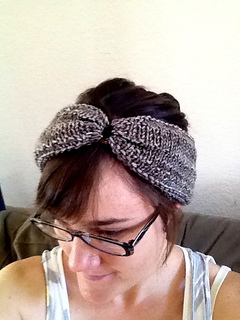 Finished Size: 3¾ “ wide and 18 (20, 22)” circumference. 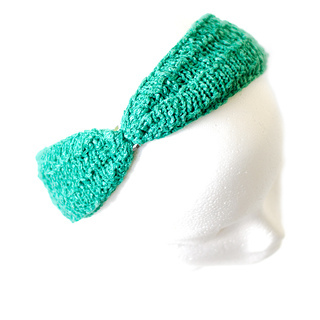 Headband shown measures 20”. Yarn: Handmaiden Sea Three (70% silk, 30% Seacell; 164 yd 150 m/3½ oz 100 g): plum, 1 skein. Needles: SSizes 6 (4 mm) and 8 (5 mm). Adjust needle size if necessary to obtain the correct gauge. Notions: Clover Needlecraft Bag’s & Tote’s Plastic O-Ring size ¾ “ in Tortoise; tapestry needle. Gauge: 16 sts and 26 rows = 4” in Ridge patt on larger needles.